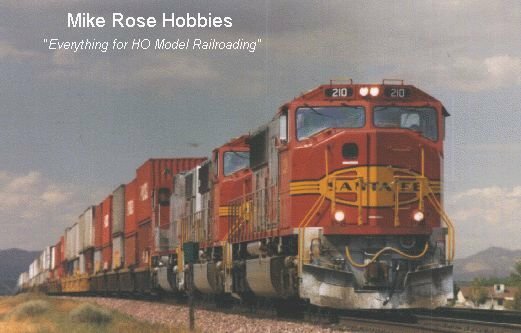 Mike Rose Hobbies is now offering custom sound installs on either new or customer-owned diesel locomotives! Featuring quality Econami and Tsunami decoders from Soundtraxx, ESU-Lok Sound and the excellent Rail Master and Lok Sound speakers (plus we're also using "sugar cube" and i-Phone type speakers now too! ), you can now get outstanding sound and operation out of virtually any modern diesel. Custom milling services with our in-house machine are available, and also make the modification of internal weights possible. We've now standardized on Monster LEDs from Big Al for their excellent quality and consistency of appearance. We can also do 1.5v light bulbs but prefer to do them only on decoders that have a 1.5v regulated output like Tsunamis. My price on lighting is $5/bulb including installation, so that would be $20 per loco for just the lights, installed in the typical dual headlight bulb on each end situation. For LEDs, a good estimate is $6 per LED, installed, including resistors. If ditch lights and/or beacons are required contact me directly as the cost/difficulty may vary from locomotive model to model. A standard labor charge of $65 covers the decoder and speaker installation, with milling of the weights at a small additional charge as required. Some locomotives need more extensive milling services at an additional charge, such as most Proto 2000 diesels, Kato NW-2s, etc. Certain models of locomotives require specialized treatment. For example, older Proto 2000 locos almost always have several cracked gears that need to be replaced with Athearn parts (that we stock), and many Athearn "blue box", Ready to Run and even some Genesis locos require a full tune-up. As an example, a group of CF-7s that I just completed were almost unusable after my initial install of the decoder and speaker/lighting/Power Pack. To get the CF-7s to run properly, they needed to be completely dis-assembled. By this I mean trucks removed, dis-assembled, and axles removed. Then the PAINTED bearing strips need to have their insides, where the bearings sit, scraped clean of paint, Conducta-Lubed, and re-assembled. Next, the PAINTED bearing spot where the truck contacts the frame needed to have the paint removed, wire-brushed, Conducta-Lubed, and then the trucks re-installed. After that, I had to remove the brass angle that the frame negative wire is connected to, clean the PAINT off the spot where it sits, wire brush it, Conducta-Lube the spot and then screw the brass angle back into place. Only then did I have a fully reliable current path and when you have that, the loco actually ran like a Swiss watch. Pricing for this varies, but the full treatment as described would be a $45 item. Decoder Pricing: $99 for the Tsunami AT-style boards or Lok Sound Select decoders, and $119 for the regular Tsunami decoders. Lok Sound 4.0 decoders are $139.99. Soundtraxx Econamis are in the $80 range, more for the higher amp models. If you'd like to simply purchase a Lok Sound decoder and have us burn in the proper sound file of your choice, that would be $109.99. Current Keepers and Power Packs: Both Soundtraxx and Lok Sound now offer effective capacitor current reservoirs that enable anywhere from 4 to 10 seconds of power interruption prevention. That means that, once so equipped, a locomotive will have virtually zero power pick up issues almost regardless of track conditions! In fact, if you pick up a charged loco it will actually run in your hand, off the track, for several seconds! This is truly a remarkable advancement for sound decoders. A Soundtraxx Current Keeper can be added during regular installation for an additional $ 35, or retrofitted on a per loco quote basis. For some locomotives it's a snap, others would require additional milling. It's also great for steam engines! Lok Sound has a similar product called a Power Pack, and it's fully buffered to enable the user to write sound files to the decoder. Power Packs are $49.95. We also offer the TCS KA-1 and 2 for non-sound situations, so please feel free to inquire about those. Speaker Pricing: $14 for most of the box-type Rail Master speakers used. We also employ Lok Sound and custom speakers using cell phone speaker raw drivers at similar price points. You'll find that Lok Sound is "best of breed" when it comes down to not only sound quality but also motor control. Their unique ability to upgrade the recording when a better one is available, and in a much smaller form factor so installation is often much easier and more flexible, make them our decoder of choice these days. Plus there are highly prototypical programming features that enhance operations, such as "coast" at idle regardless of speed and "straight to 8" for one button Run 8 sound at low speeds (available on certain files and soon to be on others) that set Lok Sound apart from the pack. Our specialty is Atlas, Athearn, Proto 2000 and Kato locomotives, along with most Overland Models brass. Please contact us to get a specific quote on your model! We are also doing steam installs on certain models, mostly for existing customers, but feel free to run any install of any kind by us. Also note that we are not considering N scale at this time. E-mail to: "mikerosehobbies@gmail.com" for your quote!